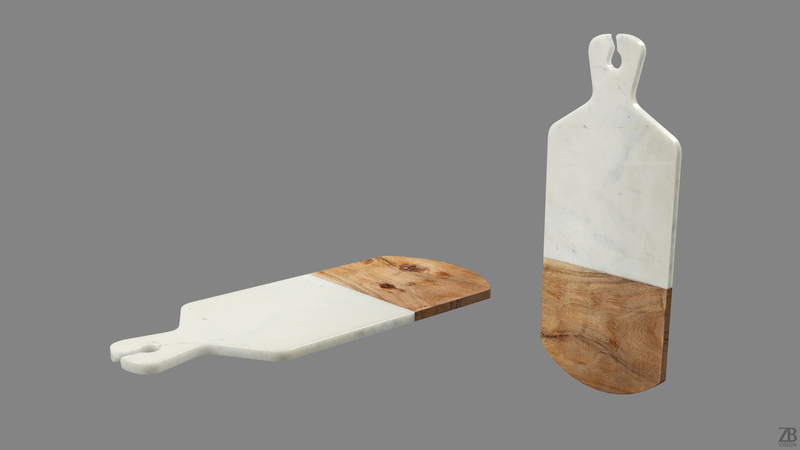 This is a realistic model of a Hubsch marble and wood kitchen chopping board. This cooking accessory was modelled and prepared for photo-realistic renderings, close-ups, CG visualization. The cutting plate model is ready to be inserted in your scene. Give your kitchen visualizations the touch of realism adding this item on the table or on the wall. The model is single mesh. The mesh is a mix of quads and polys. The model consists of roughly 3266 polys. *.max version comes with a properly set materials. You will get 2 versions: corona and vray. Other formats have basic materials with texture. So you will have to set up your material specific to your software and render engine. The kitchen cutting board comes with 2 textures, 3K. The model is uvw unwrapped. So you can easily apply a different texture map with a name, logo or whatever you desire. The original file was created in 3ds Max 2014 with V-Ray materials (2.0 and above) and Corona materials 1.5. You will receive 3DS, FBX, LWO, SKP, 3DM, C4D, OBJ and MAX files(2014). If you need any other format please inquire via 3D Ocean. All preview images were rendered with Corona. You will get only the Hubsch Cutting Board 3D model. Please also take into consideration that the preview images are the result of the post-production and the look of the chopping board model in your scene may differ due to the specific settings of your own scene. Product is ready to render out-of-the-box. Please note that the lights, cameras, and any background not described above objects are not included in the product. The model is clean and alone in the provided files, centred at the origin and has real-world scale.